Grand Anse Beach in Grenada. 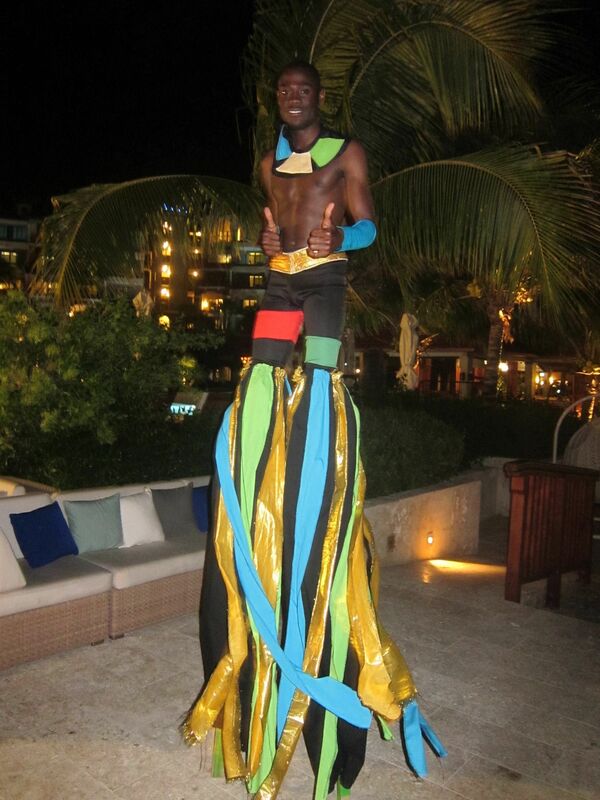 Stilt Walker performs at Sandals La Source resort. Grenada is known as “The Spice Island of the Caribbean” and produces one third of the world’s best quality nutmeg plus an array of other fragrant spices. Then there’s the fruit: bananas, mangoes, coconuts, French cashews, soursop, breadfruit, papaya… all crops that supported the small, 133-square-mile island’s economy. In 2004, just as the island’s international tourism boom was beginning, Hurricane Ivan swept across Grenada, causing massive destruction. Today, Grenada has expanded its place in Caribbean tourism with agritourism, eco-tourism adventures, watersports and fine resorts, but still on a small scale. Residents living along the East Coast of the U.S. now enjoy nonstop service from New York’s JFK, thanks to budget airline JetBlue’s new service. Many of Grenada’s best attractions are either free or very low cost. Some vacationing families will just want to hang out together and build sandcastles on the beach, and that’s just fine. You will see lots of luxury hotel and condominium properties under construction along almost every shoreline, so now is the time to see this island’s still unspoiled beauty. Grenada does not boast many all-inclusive resorts with elaborate children’s programs (see my Grenada family-friendly hotel guide), but it has a lot to offer for family time amidst a distinctive, and very present, island culture. Families traveling to the island will benefit from the improved infrastructure, renovated public facilities, a more sophisticated cruise port and more upscale hotels, all manned by the resilient and friendly Grenadians. Of course, the beaches are stunning and the clear waters are favored by savvy divers. The capital city of St. George’s is best to explore on foot, due to its hills and narrow streets. Interesting architecture, little shops, and outdoor cafes abound. The market in St. George’s operates every day except Sunday, and positively bustles on Saturdays. The Melville Street Cruise Terminal opened just after Hurricane Ivan departed, and welcomes ships from Windjammer, Norweigan, Princess, and other popular cruise lines. The market comes especially alive with activity on days when a cruise ship is in port. The Grand Anse beach area has several oceanfront hotels, restaurants, and dive shops. I found it a great place to read, walk, bob in the ocean, and watch crabs at dusk. The view of misty mountains across the bay is breathtaking. River Antoine Rum Distillery operates the same way that it did in the 1800s, surrounded by fields of tall sugarcane stalks that the river-run water wheel will eventually crush. The cane juice boils, ferments, and distills to never less than 150 proof! There’s a tasting at the end of the tour for brave adults, and children will appreciate the stinky smell. 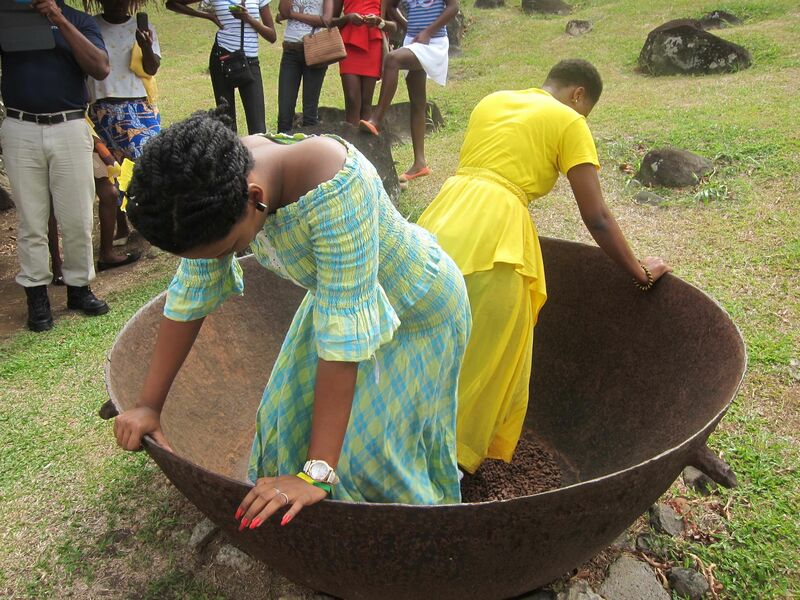 At the Gouyave Nutmeg Processing Station, visitors join an informative tour, observing the various stages of the nutmeg grading and classification process. This fragrant tour only costs a dollar. Grenada Adventure Tours offers thrill-seekers tubing excursions down the Balthazar River. Spin, swirl and slide as the current carries you along. The shady vegetation and cool water are just right on a steamy day. You’ll be outfitted with a life jacket and helmet and professionally guided the entire length of the trip. Grand Etang National Park and Rainforest Preserve is nestled in the heart of Grenada’s lush interior, an unblemished rainforest and wildlife sanctuary. A cobalt blue lake is its sparkling showpiece. Be on the lookout for exotic birds and playful Mona monkeys as you hike the winding trails. Arawak Islands is not actually an archipelago, but a natural product factory and store located in a historic house. Visitors can tour the facilities, where all products are handmade. Workers decorate spice bags, filter perfumes, and pour wax into coconut shells to make candles. White bars of soap line the walls like piano keys, waiting for infusion with natural scents like nutmeg (of course!) and vanilla. Levera National Park includes a lovely picnic area along its Bathway Beach, with vendors nearby to possibly provide the picnic. A reef buffers the incoming waves to form a calm swimming lagoon, but never swim beyond the reef, where the ocean’s temperament is quite the opposite. Grenada has no shortage of plants, but inquisitive kids enjoy seeing animals as well. Of the farm variety, there are plenty of cattle, goats, sheep, and chickens scattered around. Wild animals are more elusive, but an occasional gecko or even iguana may cross your path. For creatures under the sea, most beach hotels have snorkeling equipment and nearby dive shops. If you are traveling between April and July and your kids can handle a late night, sea turtle watching could be an intriguing option. With the protection of darkness, turtles haul themselves on shore to lay eggs and marine biologists accompany visitors to check it out. For more information, contact Caribbean Horizons at 473/444-1555. This company offers several special interest tours. Having never lost a child-like fascination with animals myself, I was delighted with the land turtles (I didn’t make it on a sea turtle trip) and various lizards that I met. And as the sun set and I sat motionless on the beach, crabs scuttled in and out of their burrows past my feet. The family-owned Grenada Seafaris company offers waterborne sightseeing close to shore, so that families with kids of all ages can appreciate the history, ecology and geography of the island. This outfitter comes recommended for its well-trained and experienced tour guides and all tours are given on a comfortable and safe 30-foot-long vessel. In an age where the biggest thrill ride defines the best destination, Grenada offers a different kind of family vacation. It is a place for playing and chatting on the beach, learning how things grow and how people make things from the earth, interacting with another culture, and appreciating the palm trees, mountains, and the sapphire blue ocean. Sound enticing? To get the full experience, you’ll need to see, hear, taste, smell, and feel the island for yourself. All visitors must present a return or onward ticket and passport identification to enter the country. Getting Around the island is easy because taxis and inexpensive minibuses are widely available. Car rental requires a Grenadian driver’s license, which visitors purchase at the Traffic Department for US$12. Rental costs about US$50-$60 per day. Remember that driving is on the left (especially in the roundabouts)! A great way to hit some sights mentioned in this story is to take a guided tour. Many operators play up ecotourism, with river tubing, whale-watching, mountain biking and Jeep expeditions particularly popular, but there are a variety of active and cultural itineraries, so call ahead to discuss what you’re looking for. Well-known land and marine tour operators include Mandoo Tours, which offers a variety of Grenada tours, and Adventure Jeep Tours. Here are some quick tips to make your trip planning easier. Weather: Average temperatures fall in the 80sF, and trade winds provide relief from the heat. The island experiences a “dry season” from January to May, followed by the “rainy season” with more frequent passing showers. Language: Grenadians speak English; the local language if peppered with a French/African patois. Currency: Grenada uses the Eastern Caribbean Dollar but all businesses accept U.S. currency, traveler’s checks, and credit cards. Information:The Grenada Board of Tourism (473/440-2279) is very helpful. In planning your visit, consult with their website at GrenadaGrenadines.com. Handicap Accessibility: Thanks to its volcanic formation, this island is very hilly. The roads are winding, and some hotels have steep outdoor stairs. If you have small children or any accessibility issues, research the layout of your potential accommodations in advance. Crime: Grenada boasts one of the lowest crime rates in the Caribbean, thanks to the fact that people know each other! (Island population = about 102,000 people) Of course, the ordinary precautions apply to avoid petty crime — don’t leave valuables unattended outdoors, don’t parade through town in your bikini, etc. Shopping:Despite Grenada’s attempt to organize a consolidated vendors’ market, vendors will probably approach you on the beach selling various crafts — if you are not interested, a confident “No, thank you” works. Don’t Forget the Beach! 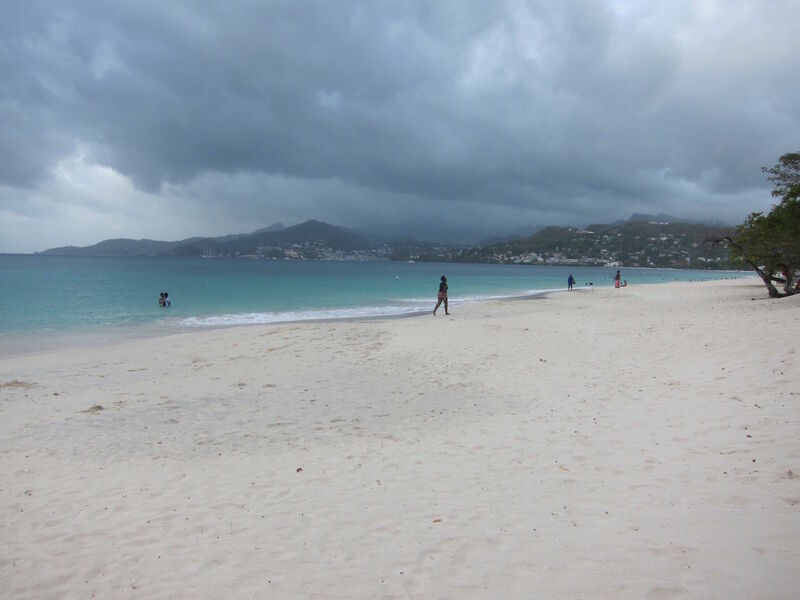 All beaches in Grenada are open to the public, which means you’ll be sharing sand and sea with locals. There are no lifeguards at beaches and most hotel pools, so keep an eye (or a grasp!) on your kids in the water. And of course, remember the bottled water, sunscreen, and bug spray!